When I find a good one-pot dish it makes both of us happy. 🙂 I found this Honey Lemon Chicken recipe on a bag of sushi-style rice. 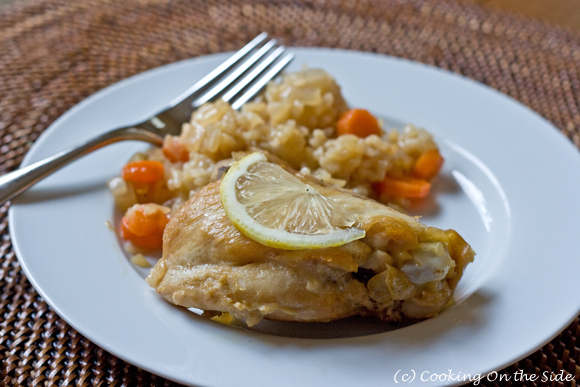 The chicken, rice and vegetables all simmer in a braising liquid of honey, lemon, soy sauce and chicken broth in the same pot. Not only did this save me from dirtying too many dishes, it also saved on time – I had dinner on the table in about 45 minutes. Most importantly, the sweet and savory flavors were wonderful. What’s more comforting than chicken and rice? Grate enough peel from lemon to measure 1 teaspoon. Extract 1 tablespoon lemon juice from lemon. Dissolve bouillon in 1 1/4 cups hot water. Mix in honey, soy sauce, lemon juice and peel. Heat a large frying pan over high heat. Add oil; coat bottom of pan. Add thighs, in a single layer. Cook 3 to 4 minutes on each side, or until browned. Remove from pan. Add onion to same pan; sauté 30 seconds. Mix in rice, carrots, pepper and honey mixture. Arrange chicken, in a single layer over top. Bring to a boil. Reduce heat to low. Cover and simmer 30 minutes, or until liquid is absorbed. Remove from heat. Let stand covered 10 minutes before serving. * I found Botan Calrose Rice in the Asian section of my local grocery store. Wal-Mart carries it as well so it should be pretty widely available. If you’re not able to find it, try another short-grain sushi rice. 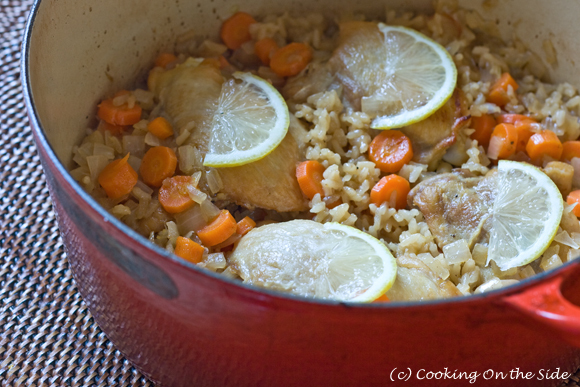 Life is easier using one pot especially when it looks and sound this delicious! I made this for dinner… DELICIOUS!!!!!!!! That’s fantastic, I’m so glad you liked it! I made this last night with jasmine rice. Very good! Definitely going to make this again. I would add some grated ginger and garlic to this. Made this last night. Soooo good! Thanks again Kathy. I found your blog by googling the recipe from the back of the rice bag – always nice to know someone else has made it. Great blog and I look forward to trying some of your other recipes! I had to laugh at your post – my husband and I have a similar arrangement about cooking and cleaning up, and he has the exact same complaint: I use too many dishes when I cook! He liked this recipe, too! Thanks! Previous post: The Results Are In: Which Flour Made the Best Biscuits?